“Hi Jennifer, I just wanted to say a big thank you for the baby and kids’ market at Terrigal yesterday. I was a first time stallholder and I had a ball! Although I was by myself and didn’t have as much stock to sell as others, I raised about $380 which I am very happy with. But most of all I enjoyed the sense of communing with others in the world of pre-loved baby and kids goods. It is wonderful to think that items I used to care for my dear little Samuel through his baby and toddler stages, can now find a new home. It was with mixed feelings that I sold his baby equipment – happy to see that they will be put to good use in the life of another baby, excitement to get some money back, relief to have decluttered our home but also a bit emotional to say goodbye to symbols of his baby and toddler years. Oh and not to forget the fun I had designing and setting out my blue and green-themed stall with teddy bear motifs on posters and prices notices. So until next time, a big thank you to you and the other staff who make this such a wonderful event for buyers and sellers alike. 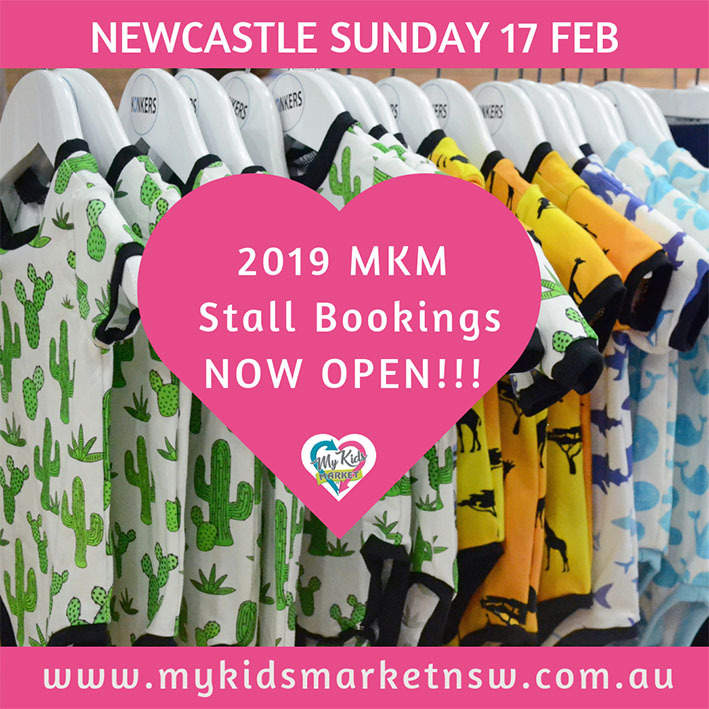 My Kids Market NSW is the original and largest market for families to buy, sell and recycle quality preloved babies and kids’ items. Stallholders sell their families gently used baby and kid’s goods and earn some extra cash by hosting a stall. All gently used items such as boys and girls clothing, toys, prams, highchairs, shoes, books and other nursery items that your kids no longer need may be sold at the Market. It’s a great way to declutter your home, earn some extra cash and reduce landfill at the same time! Shoppers will enjoy huge savings on all the popular brands when buying quality preloved items for a fraction of the cost of buying new. The market is held indoors with free kid’s activities all morning! Market Entry $4 Adults, Kids FREE. Cash only, no ATM on site. For more details on hosting a stall visit the website. Business Stalls are welcome too for those wanting to reach a new target audience!